The undersigned American academicians who specialize in Turkish, Ottoman and Middle Eastern Studies are concerned that the current language embodied in House Joint Resolution 192 is misleading and/or inaccurate in several respects. As for the charge of “genocide” no signatory of this statement wishes to minimize the scope of Armenian suffering. We are likewise cognizant that it cannot be viewed as separate from the suffering experienced by the Muslim inhabitants of the region. The weight of evidence so far uncovered points in the direct of serious inter communal warfare (perpetrated by Muslim and Christian irregular forces), complicated by disease, famine, suffering and massacres in Anatolia and adjoining areas during the First World War. Indeed, throughout the years in question, the region was the scene of more or less continuous warfare, not unlike the tragedy, which has gone on in Lebanon for the past decade. The resulting death toll among both Muslim and Christian communities of the region was immense. But much more remains to be discovered before historians will be able to sort out precisely responsibility between warring and innocent, and to identify the causes for the events which resulted in the death or removal of large numbers of the eastern Anatolian population, Christian and Muslim alike. Statesmen and politicians make history, and scholars write it. For this process to work scholars must be given access to the written records of the statesmen and politicians of the past. To date, the relevant archives in the Soviet Union, Syria, Bulgaria and Turkey all remain, for the most part, closed to dispassionate historians. Until they become available, the history of the Ottoman Empire in the period encompassed by H.J. Res. 192 (1915-1923) cannot be adequately known. 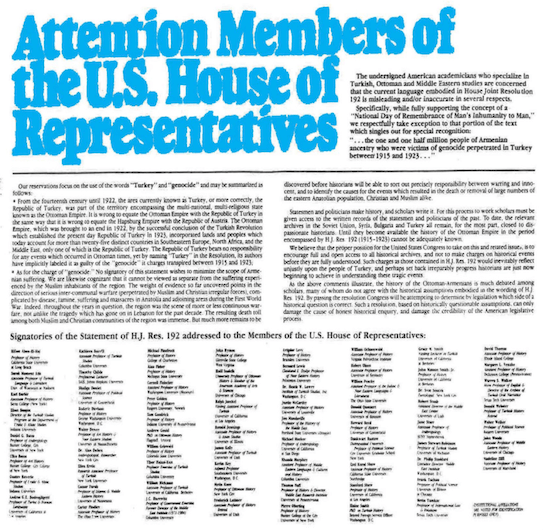 We believe that the proper position for the United States Congress to take on this and related issues is to encourage full and open access to all historical archives and not to make charges on historical events before they are fully understood. Such charges as those contained H.J. Res. 192 would inevitably reflect unjustly upon the people of Turkey and perhaps set back progress irreparably. Historians are just now beginning to achieve in understanding these tragic events. As the above comments illustrate, the history of the Ottoman-Armenians is much debated among scholars, many of whom do not agree with the historical assumptions embodied in the wording of H.J. Res. 192. By passing the resolution Congress will be attempting to determine by legislation which side of the historical question is correct. Such a resolution, based on historically questionable assumptions, can only damage the cause of honest historical inquiry, and damage the credibility of the American legislative process. Adjunct Professor Southeastern University Washington, D.C.
Institute of Turkish Studies Inc. Washington, D.C.
Executive Director, Middle East Institute Washington, D.C.